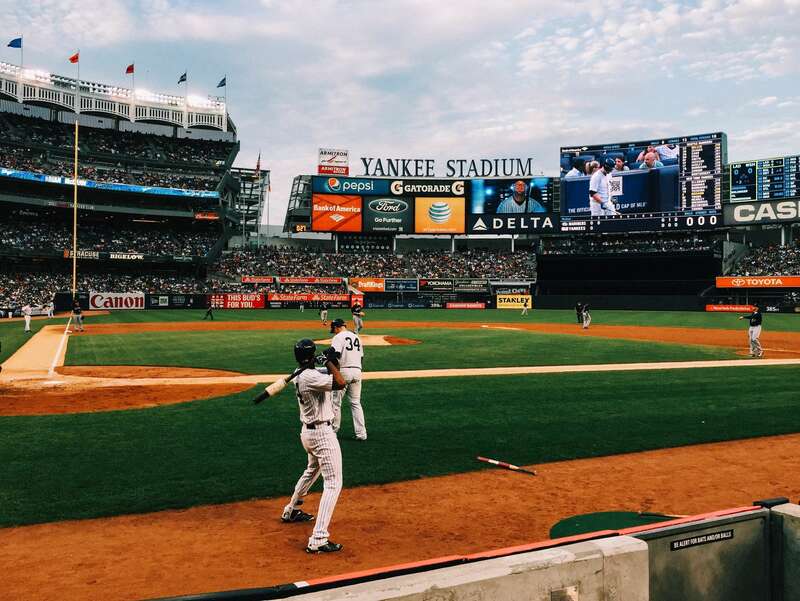 The New York Yankees have a history that dates back more than a century, to when the franchise was first purchased in 1903. Although the team wasn't officially called the Yankees until a decade later, they were well on their way to making baseball history by this time. The Yankees have been fortunate to have many notable names in baseball in the lineup over the years, including Babe Ruth, Lou Gehrig, Joe Dimaggio, Reggie Jackson, and Mickey Mantle. The Yankees have won 27 World Series championships as of 2017 as well as 40 American League pennants and 18 division titles over the course of the team's history. Jan. 9, 1903: Businessmen Frank Farrell and Bill Devery bought the franchise, paying $18,000. They then moved the baseball team from Baltimore to Manhattan. April 22, 1903: The Highlanders (the original team name) played their first game at Washington, losing three to one. April 1913: The Highlanders' team name was officially changed to the Yankees. The team also moved to the Polo Grounds, which was also the home of the New York Giants. Jan. 3, 1920: The Yankees finalized the contract for Babe Ruth, bringing him to New York City from the Boston Red Sox in exchange for a cash payment. May 5, 1922: Construction started on Yankee Stadium. April 18, 1923: Yankee Stadium officially opened, and the Yankees beat the Boston Red Sox in a 4-1 win. Babe Ruth hit the first home run ever in Yankee Stadium. June 1, 1925: Lou Gehrig's streak of 2,130 consecutive games played began. June 3, 1932: Lou Gehrig hit four home runs in one game, becoming the first player ever to do so. July 14, 1934: Babe Ruth hit his 700th home run in a game played in Detroit. Nov. 21, 1934: The Yankees added Joe Dimaggio to the team, paying $50,000 for his contract. May 2, 1939: Lou Gehrig's playing streak officially ended when he did not play in this game against Detroit. June 2, 1941: Lou Gehrig succumbed to amyotrophic lateral sclerosis at age 37. May 28, 1946: The first night game happened at Yankee Stadium, with the Yankees losing against Washington. Aug. 16, 1948: Babe Ruth died at age 53 of throat cancer. April 17, 1951: Mickey Mantle played his first major league game at Yankee Stadium. Dec. 12, 1951: Joe Dimaggio retired on this date. Oct. 5, 1953: The Yankees won their fifth world championship in a row. Nov. 2, 1964: CBS purchased 80 percent of the Yankees, later buying the remaining percentage. April 15, 1976: The recently remodeled Yankee Stadium opened, with the Yankees beating the Minnesota Twins. Nov. 29, 1976: Reggie Jackson signed on with the Yankees for a five-year contract. July 24, 1983: The Pine Tar game went down between the Yankees and Kansas City, with George Brett hitting a home run in the ninth inning to give the Royals the lead. Umpires then nullified the home run due to too much pine tar being found on the bat. August 13, 1995: Mickey Mantle died of cancer at age 63. Oct. 21, 1998: The Yankees won the World Series with a four-game sweep against the San Diego Padres. Oct. 27, 1999: The Yankees played the last baseball game of the 20th century, finishing a four-game sweep against the Atlanta Braves to win their 25th World Series. Oct. 26, 2000: The Yankees won their 26th World Series, this year against the New York Mets. April 3-4, 2009: The Yankees played the first two games in the new Yankee Stadium against the Chicago Cubs, winning both games. Nov. 4, 2009: The Yankees won the World Series for the 27th time, this time against Philadelphia. The New York Yankees have played in 40 World Series, setting the record for the most appearances as well as victories. The Yankees share the record for the most World Series losses with the Los Angeles Dodgers. With the move to the new stadium in 2009, the New York Yankees began a new era. During the 2017 season, a new group of young baseball players began working to revitalize the team with new energy.